At our Board of Directors meeting on August 27, we began a creative fundraising brainstorming session, which generated the idea for a “compost bucket challenge,” in the same vein as the recent (and incredibly successful) Ice Bucket Challenge for ALS research. Realizing that we are not talking about generating funding for critical scientific research, but raising capital for a local gardening and education nonprofit, several board members reacted as though, “Why not?” I went ahead and took the first crack at just such a video endeavor. Compost is generally dry, contains all kinds of organic substances (and worms, if you’re lucky), and most people don’t want to roll around in it (much less have it dumped on their heads.) Right? It went well enough, I think. 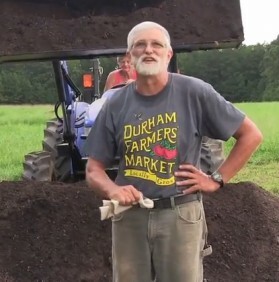 Tim’s “challenge” was different, in that he mainly challenged people to create their own compost and to learn more about SEEDS, in addition to a contribution. Why not, indeed! Whether or not this idea takes off as a series of videos, we have already succeeded in drawing attention to SEEDS’ mission and work. If you want to participate in the fun, you can create your own video with the help of folks at SEEDS, using compost already there, putting your own twist on the concept. We do recommend that you practice what you want to say, include why you care about SEEDS, and why you want people to pay attention. Whether you challenge people individually by calling out names, create a challenge of another sort, or take a turn rolling around in compost — is up to you! I suggest you keep the video brief ( 2-3 minutes should be the maximum length). If you want help with the videotaping, I can be reached at wil@wilweldon.com and will be happy to schedule a time to assist. Happy composting! This is a collection embedding hundreds of free audio books covering a wide variety of themes and https://justdomyhomework.com topics meticulously curated by the folks in librivox.